A man who reportedly claims to be from the future where everyone is dead was arrested after allegedly assaulting an employee and stealing chicken and bacon from a fast-food restaurant in Oklahoma City. Witnesses reported that a man, identified as Dante Rashad Anderson, 36, walked into a Carl's Jr. on Friday and screamed at employees to give him food. When he was denied, Anderson went to a nearby Arby's and again demanded food. The victim told police that Anderson jumped on top of the counter, jumped off, walked to the kitchen and grabbed her by the arms, forcing her against a wall. He then grabbed a handful of bacon and chicken and walked out. While Anderson left, he reportedly broke the restaurant's front door, although the victim does not know how he broke it. Police later found Anderson lying on the ground near a nearby Taco May. He told officers that he took the food because he was hungry and nobody helps him. "I got bacon and chicken and I scared the lady," Anderson reportedly said to police. "She thought I was going to hurt her, but I was not. I was just hungry and wanted some food. That is what I have to do to get food. "I knew I was going to jail for doing this, but no one wants to help me out." Anderson also admitted to kicking multiple vehicles outside the restaurant. "I am from planet Earth 2016 and am four years advanced on you, and you guys are always trying (to) kill me," the report said. "On my planet Earth, everyone is dead and I walked here from there." 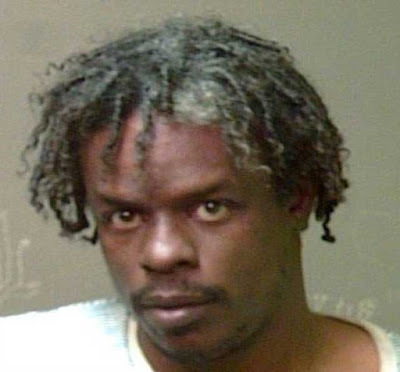 Anderson was taken to an area hospital to have his ankle examined before being booked into the Oklahoma County Jail. He was arrested on complaints of assault and battery, larceny and two destruction of property.